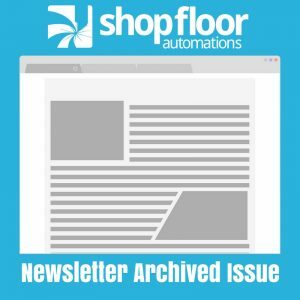 The following is an archived copy of the Shop Floor Automations Newsletter – February 2012. Bloomberg: “Manufacturing in the U.S. grew in January at the fastest pace in seven months, adding to signs of a global pickup from Germany to China.” – We hope it is for you too! What method do you use to remind yourself to change the oil in your car? Is it sticky notes, when the red light goes on or when it all breaks down in the middle of your road trip? Bigfoot CMMS (Computerized Maintenance Management Software) can help you with everything from CNCs, forklifts, manual equipment, HVAC, managing your routine maintenance, tracking your repairs, parts, procedures for services and reporting history and cost. It is simple to use over the web or on your smartphone and is billed per user with no long term commitments. We would like to hear from you! So we decided to run a contest. The best SFA success stories will win! Contact us to ask how. A spreadsheet of production orders is like a newspaper. By the time you get it, the information is out‐of‐date. Spreadsheets are a great way to maintain lists of information, but a spreadsheet can’t react to changes to the production schedule that occur every day when new orders arrive, orders are canceled, or when customer‐requested delivery dates and quantities change. With the frequent changes that occur in manufacturing businesses today, a spreadsheet can’t respond quickly enough. How much manual effort is used to maintain the spreadsheet? JobPack Master Scheduler, a real‐time scheduling system, integrated to your ERP system, can receive order information effortlessly, and immediately identify resource constraints caused by overloaded resources. The ability to simulate multiple scenarios to resolve the constraints is impossible for a spreadsheet.